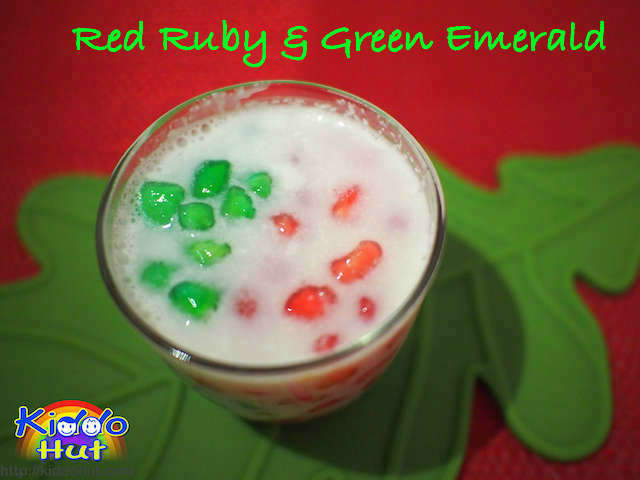 Red Ruby is a Thai dessert and Red Ruby with Gula Melaka is a dessert you can find more commonly in Singapore and Malaysia. 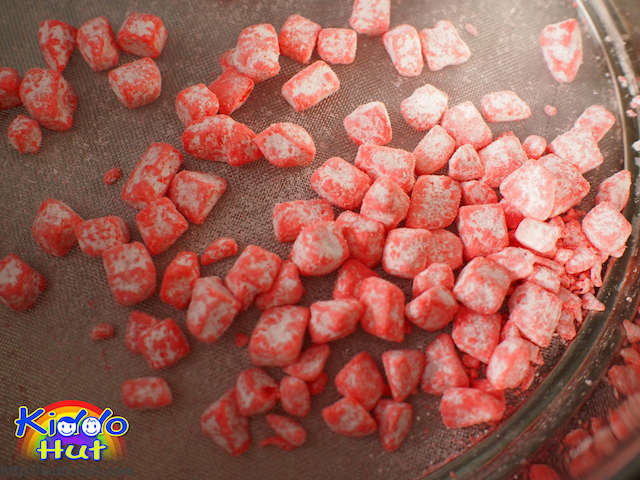 The red ruby is famous for its chewy texture that comes crunchy at the same time. Topping up with the aromatic coconut sugar and coconut milk, it is a sinfully tasty dessert. Beside making red rubies, I love green emeralds too. You can purchase the gula melaka syrup from the shops but I prefer to make it myself so that I can control the texture. I prefer to serve the dessert in thick syrup and it is very easy to make. For the coconut milk, to keep it longer, I boiled it with a pinch of salt. Still, it is recommended not to keep it too long or overnight as coconut milk can turn bad very fast. You can keep the cooked coconut milk in the fridge for later serving. If you prefer icy cold red ruby dessert, add some shaved ice. 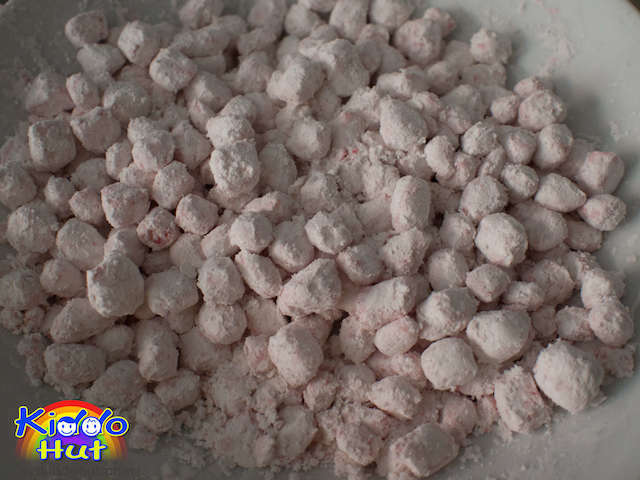 This is a really easy dessert to make, try it today! 1. Remove excess water from the cubed chestnut, add a drop or two of colouring and mix well. 2. Toss the coloured chestnut in the flour. 3. Strain the chestnut in a sieve to remove excess flour. Then, put the chestnut in another bowl. 4. Sprinkle some water, do not sprinkle too much water just some mist onto the chestnut. 5. Toss the chestnut in the flour again. Repeat steps 3 – 5 for another 3 times. You can coat the chestnut with more flour to get the chewy texture by repeating the process few more times. 6. Boil the coated chestnut in boiling water. 7. When the chestnut floats on the water, it is cooked. Strain it. 1. 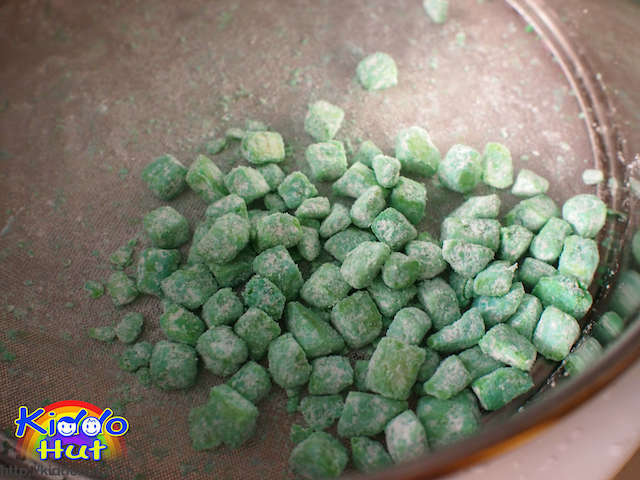 Cut the Gula Melaka in small pieces. 2. 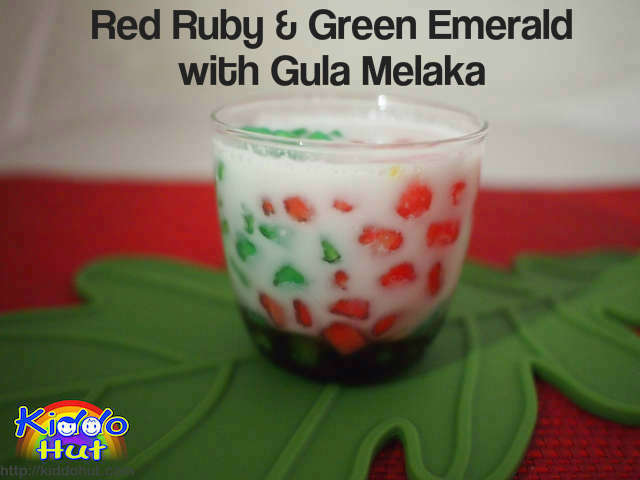 Melt the Gula Melaka in 15ml of water and some pandan leaves. 3. 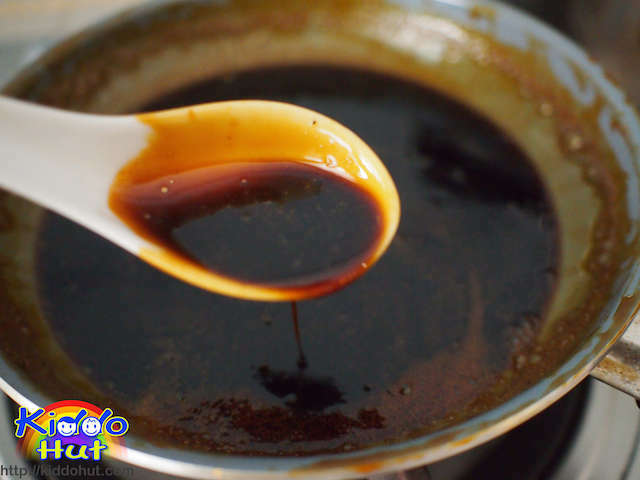 Once the syrup is thickened to desired texture, remove from heat. 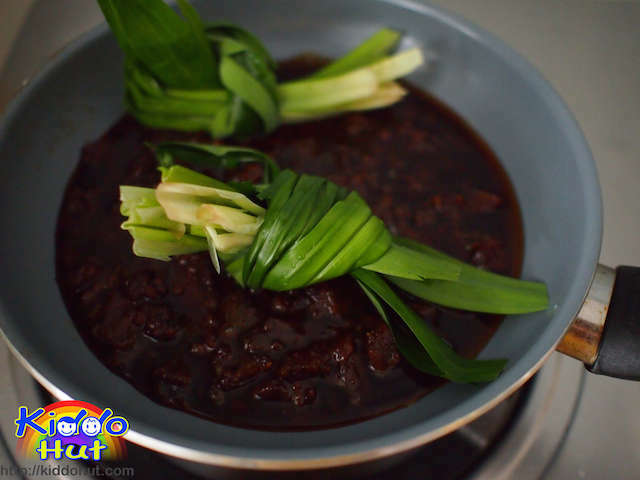 Remove the pandan leaves. 1. Boil the coconut milk and add a pinch of salt. 1. 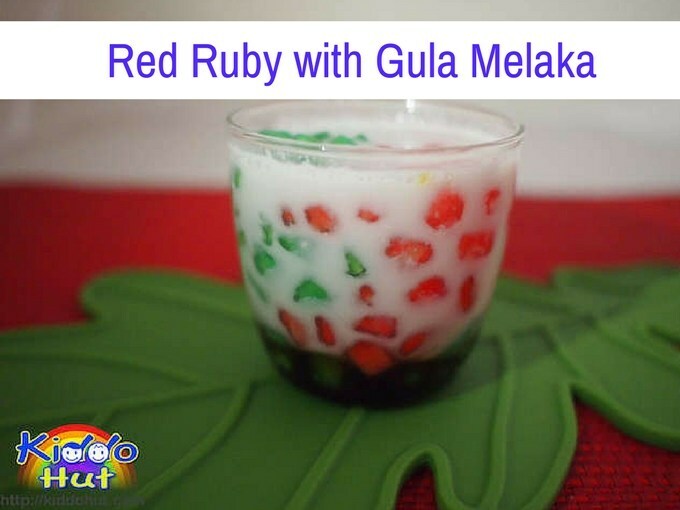 Pour some Gula Melaka syrup at the bottom of the cup / bowl. 2. Add the red ruby / green emeralds. 3. Pour the coconut milk into the cup / bowl. 4. 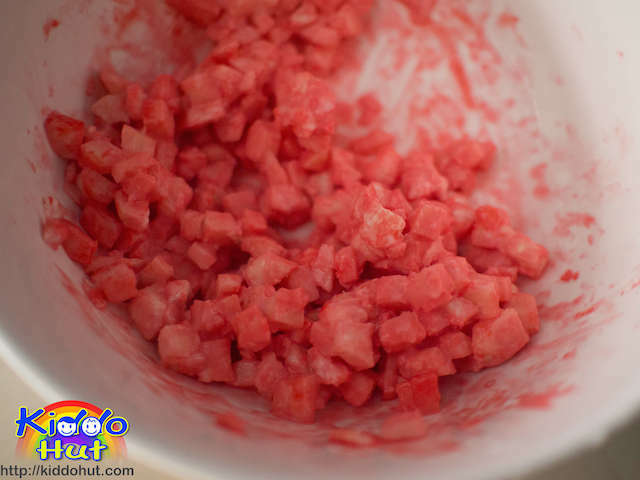 You can add some shaved ice or leave it in the fridge or just serve warm.